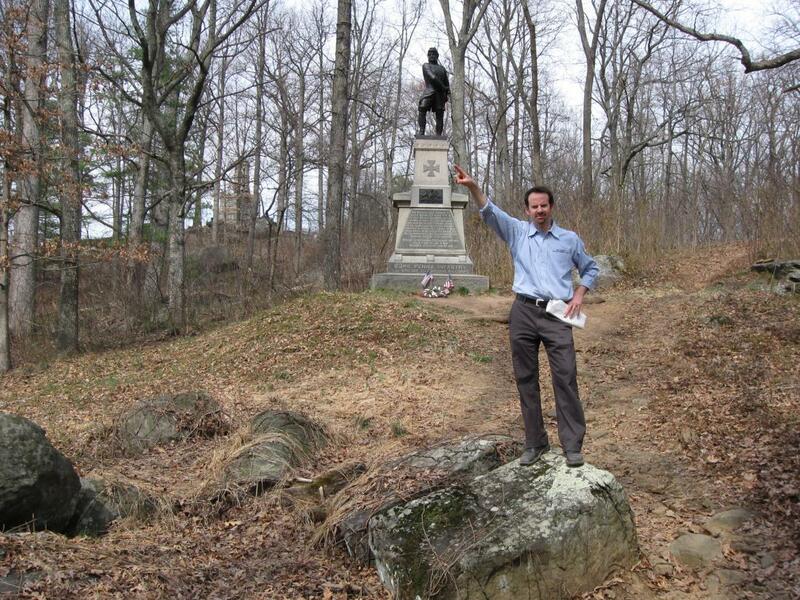 Gettysburg Licensed Battlefield Guide Garry Adelman is the host for our Myth of Little Round Top series. He has been a Licensed Battlefield Guide since 1995. He is on the south side of Little Round Top. The monument to the 20th Maine Infantry Regiment is in the background. This view was taken facing north at approximately 2:45 PM on Sunday, March 21, 2010. 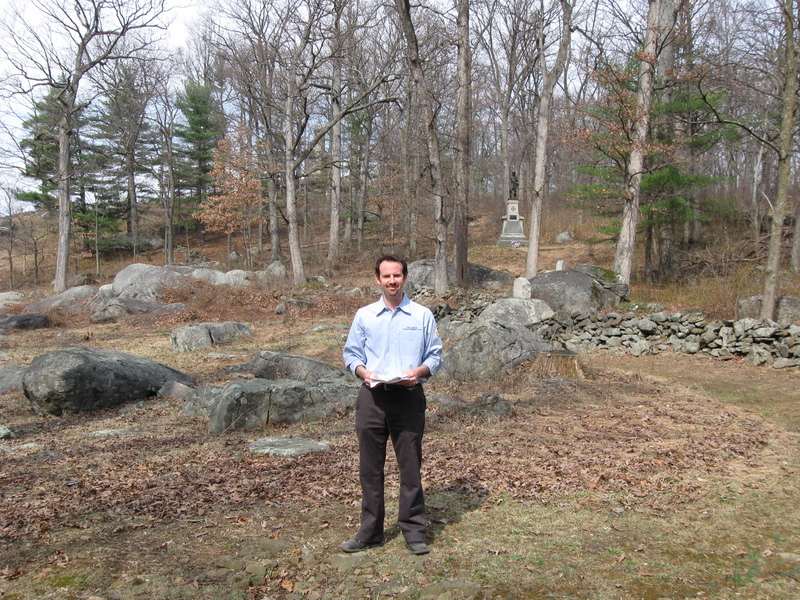 In today’s post, Gettysburg Licensed Battlefield Guide Garry Adelman shows the attack on the 20th Maine Infantry, and explains how the Little Round Top legend slowly grew over time. 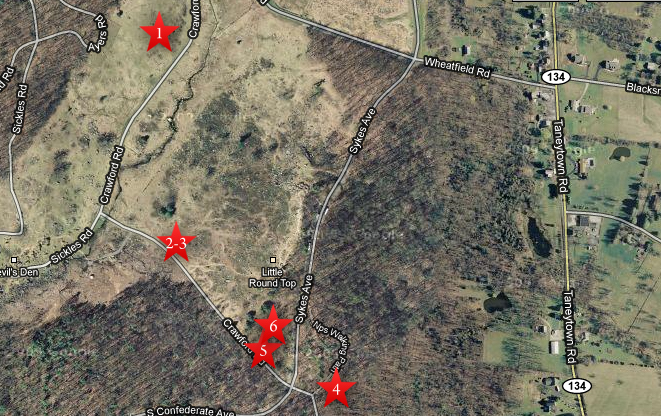 This map shows us the locations taken of videos for The Myth of Little Round Top series. 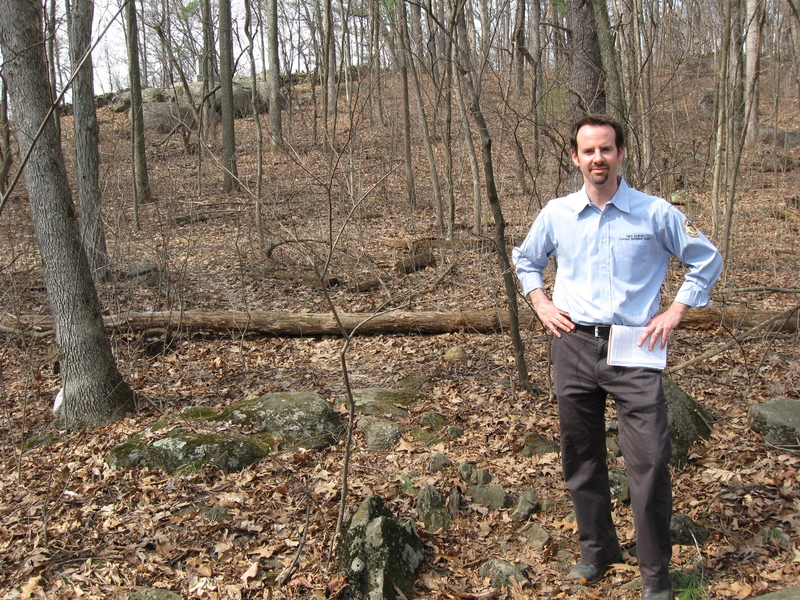 Video #1 was taken on Houck’s Ridge near Ayres Avenue. Videos #2 and #3 were taken on Warren Avenue, which is mislabeled Crawford Avenue on this Google Map. Video #4 was taken southeast of the monument to the 20th Maine Infantry Regiment. Video #5 was taken south of the 83rd Pennsylvania Infantry monument, near Warren Avenue. Video #6 was taken near the monument to the 83rd Pennsylvania Infantry Regiment. This map was created facing north at approximately 7:00 PM on Wednesday, March 24, 2010. Gettysburg Licensed Battlefield Guide Garry Adelman is standing below and southeast of the monument to the 20th Maine Infantry regiment, part of which may be seen on the large rock formation in the upper left background. This view was taken facing northwest at approximately 2:45 PM on Sunday, March 21, 2010. In Video #4 (Videos #1-#3 were shown in our previous post) Gettysburg Licensed Battlefield Guide Garry Adelman shows the attack of Confederates from Alabama on the 20th Maine Infantry Regiment. This view was taken facing northwest to northeast to north at approximately 2:45 PM on Sunday, March 21, 2010. 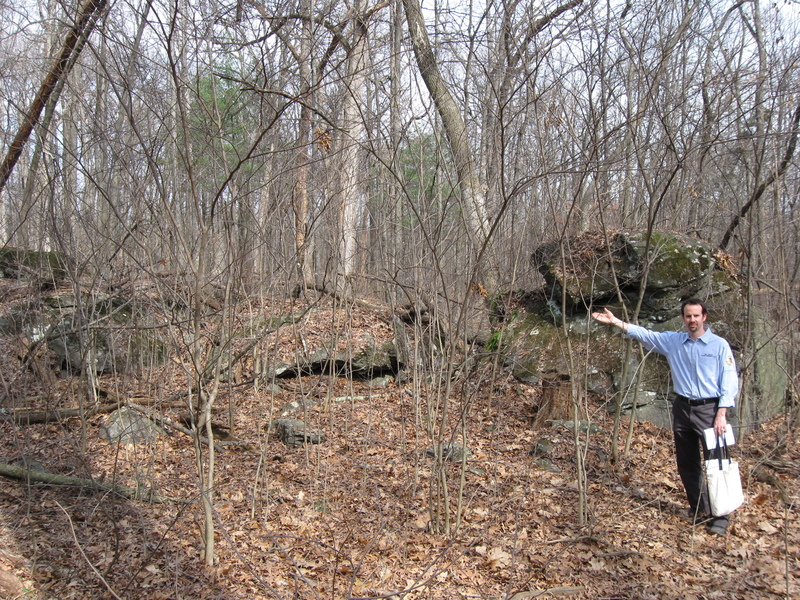 Behind Garry is the large rock upon which part of the 15th Alabama Infantry Regiment pivoted as the unit advanced towards the position of the 20th Maine Infantry Regiment on July 2, 1863. Garry is point to the long rock formation behind which the Alabamians took position. This position was perpendicular to their original line. Once in position behind the rocks, the Alabamians would have been more or less facing the camera. This view was taken facing northeast at approximately 2:45 PM on Sunday, March 21, 2010. Licensed Battlefield Guide Garry Adelman has now moved west of his previous position. Warren Avenue is behind the photographer. The monument to the 83rd Pennsylvania Infantry Regiment is in the background, on the south slope of Little Round Top. This view was taken facing north at approximately 2:45 PM on Sunday, March 21, 2010. In Video #5 Licensed Battlefield Guide Garry Adelman discusses the growth of the legend of Myth of Little Round Top. This view was taken facing north at approximately 2:45 PM on Sunday, March 21, 2010. 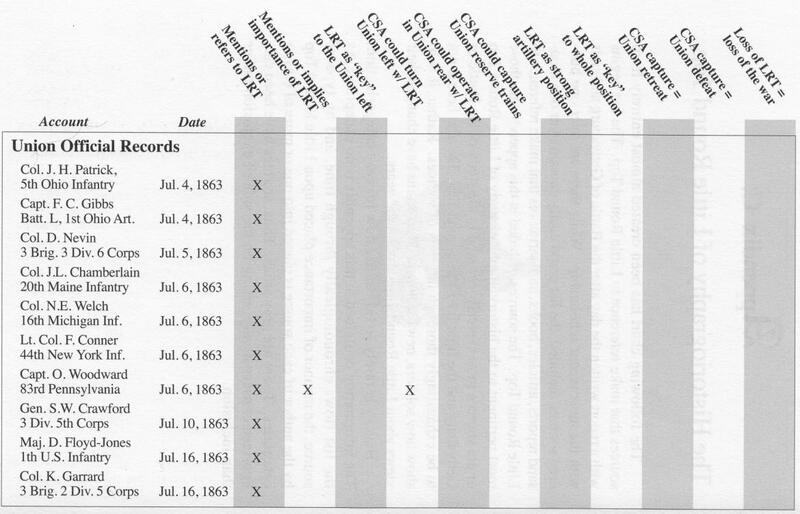 Please click here to view a 10-page PDF from Garry’s book, The Myth of Little Round Top, showing the Historiography of Little Round Top. This chart was created by Garry Adelman in 2000. Garry Adelman is standing near the monument to the 83rd Pennsylvania Infantry Regiment on the south slope of Little Round Top. He is pointing to something, possibly Big Round Top, but who really knows? This view was taken facing north at approximately 2:45 PM on Sunday, March 21, 2010. 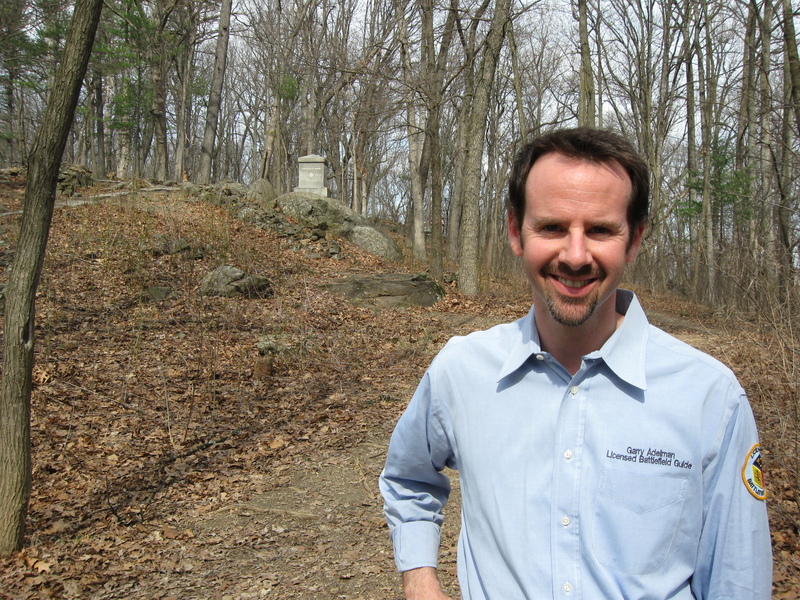 In Video #6 Garry Adelman is more specific in his look at contemporary accounts that discuss the importance of Little Round Top. This view was taken facing north at approximately 2:45 PM on Sunday, March 21, 2010. 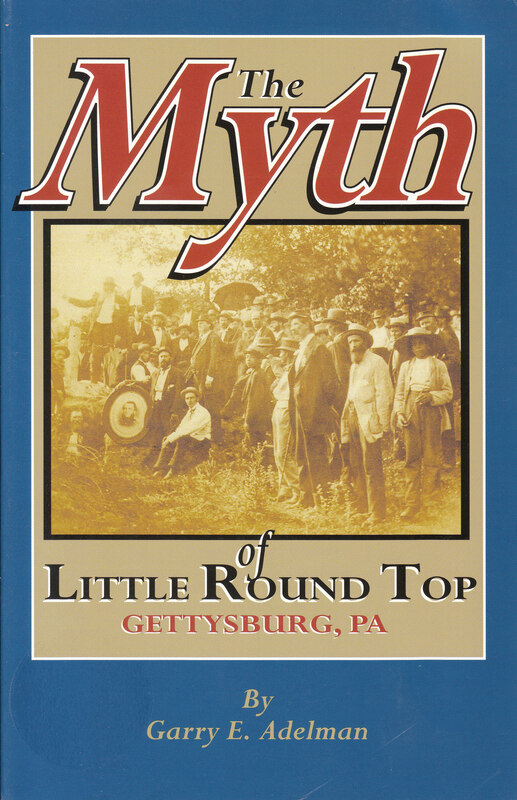 Garry’s book, The Myth of Little Round Top, was published by Thomas Publications, Gettsyburg, Pennsylvania, in 2003. For ordering information, please click this link. 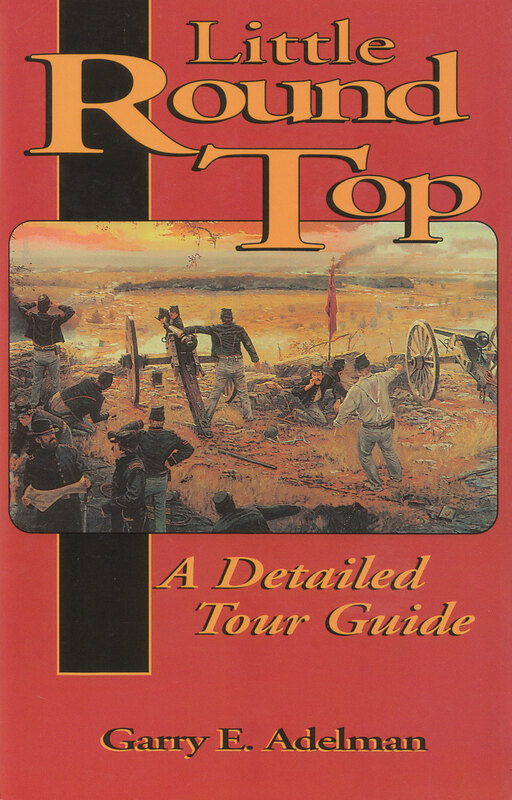 Garry’s book, Little Round Top: A Detailed Tour Guide, was published by Thomas Publications, Gettsyburg, Pennsylvania, in 2000. For ordering information, please click this link.